Architect V.S. Thurairajah has made a significant contribution to the field of Architecture in Sri Lanka over a period of forty years. 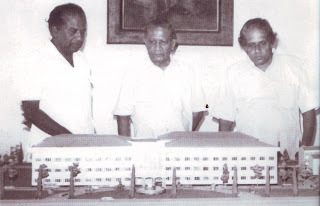 When Architecture as profession was hardly known in Ceylon (now Sri Lanka) Thurairajah choose as his carrier. The only university in Ceylon then, the Colombo University, did not have a faculty of Architecture. A student of Architecture had then to either go to Bombay or the United Kingdom to follow a course in Architecture. In 1948 Thurairajah joined the JJ School of Arts in Bombay. 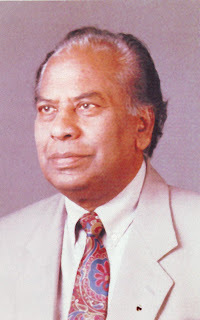 He completed a three – year course and returned to Ceylon and joined the Public Works Department as a Junior Architect in 1951. The Department sent him for further studies to London on a Colombo plan Scholarship in 1954. He followed a course in Architecture at the Architectural Association School of Architecture in London and obtained the AA Diploma in 1957. He also followed a post graduate course in Tropical Architecture. He returned to Ceylon in 1956 and continued to work as an Architect in the Public Works Department of the Government of Ceylon. After serving for eight years there he ventured in to private practice. He floated a firm of Chartered Architects under the name of Thurairajah Associate in 1964. He was elected as an Associate of the Royal Institute of British Architects in 1956 and as an Associate of the Indian Institute of Architects in 1958, and as an Associate of the Royal Australian Institutes of Architects in 1958, and also an Associate of the institute of Arbitrators, London in 1962. Subsequently he was elected as a fellow of the Indian Institute of Architects in 1965; a Fellow of the Royal Institute of British Architects in 1967; a Fellow of the Sri Lanka Institute of Architects in 1976; and also as a Fellow of the Royal Australian Institute of Architects in 1989; He was elected as Fellow of the institute of Arbitrators in 1968. Building of numerous types designed by him dot the cityscape in Colombo and its suburbs. Building types ranging from domestic building to mufti storied hospitals, Factories, Hotels, University Complexes, and Hindu Temples designed by him can be spotted in prominent sites and discreet locations in Colombo City and throughout the length and breadth of Sri Lanka. The key characteristic of the architectural style of Mr. Thurairajah is its distinctive functional from that is soundly based on fundamentals of aesthetic principles. His training and experience in Tropical architecture too is clearly evident in his approach to design solutions in the varied assignments he has carried out in Sri Lanka and abroad.